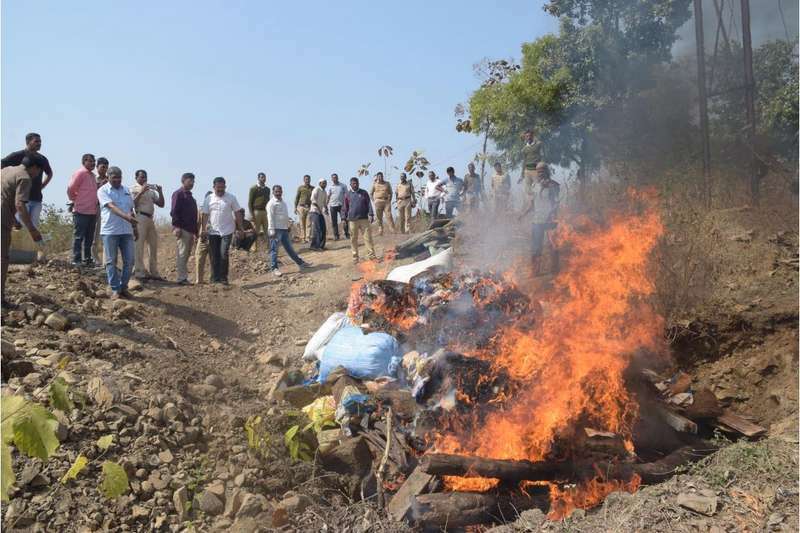 Nagpur Police officials burning contraband worth Rs 1.36 crore. Contraband, worth Rs 1.36 crore, which was seized by Nagpur Anti-narcotics cell over a period of five years from 2012 to 2017 in 24 cases, was destroyed by the cops on Tuesday. The contraband consisted of around 1,351 kgs of marijuana and 27 grams of cocaine (worth Rs 1.12 lakh). The illegal drugs were destroyed following a courts order. The destruction of the contraband took place under the guidance of Commissioner BK Upadhyay and Joint CP Ravindra Kadam.